Before checking out the great photos here, I'd love for you to check out the feature on me at Handmade News. Please vote positive on it. Well, now that I'm finally focused on fall, not to many flowers and bumble bees anymore. 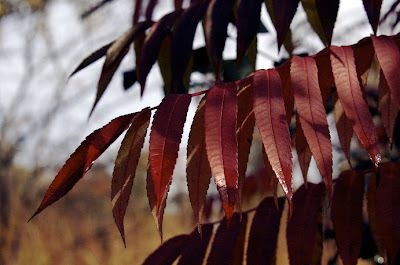 I'm going to share some photos pf pretty red leaves. Having spent so much time learning about bees and flowers, I'm afraid I don't know my trees. I thought these were realy pretty and popped out from the background. These leaves contrast with the greenish/yellow ones around them. Thanks for visiting. Stop by tomorrow for some cool berries and a really neat water drop. 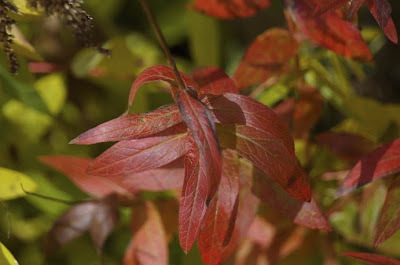 As always, stop by The Shutterbug Eye on Artfire and see more of my photography as well as lovely photo note cards. We must have been thinking alike with our posts for today! :) These are beautiful colors!